This is probably the easiest method to install Radiant Barrier AtticFoil™ is to lay the foil out OVER the existing insulation on the attic floor. This method can be used in any climate, though it historically has been most popular in colder climates. If you’re in a WARM or mixed climate (southern half of the USA), then read on. If you’re in a predominately COLD climate (northern half of the USA) then check out our new SuperPerf™ product designed for your area. The reason this method is so effective is because radiant barrier makes regular insulation more effective. Installing foil on top of the insulation acts like the windproof shell on a jacket. It helps minimize the convective looping within the insulation. By minimizing airflow within the insulation and minimizing radiant heat loss/gain from your attic, radiant barrier will make your home more comfortable and more efficient creating a green energy barrier in your attic. Watch the video below to learn WHY you need to do this to fix the biggest energy waster in your home. Click to download printable install instructions for this method. Cut pieces outside the attic. The best way is to cut several pieces at a time and work in sections. After you cut several pieces, have your helper bring the pieces of foil up into the attic. There are some pros and cons to this method, so we recommend that you read the information we have compiled on The Best Radiant Barrier Install Method before you decide which method to go with. Also, please take time to read the warnings regarding installing foil directly over attic insulation in cold climates. 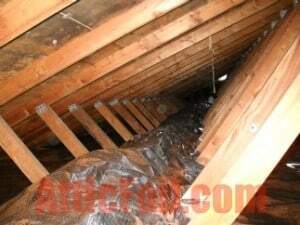 The install process is usually pretty simple and quick in most attics. It is typical for two people to easily install radiant barrier into an average size home in just a few hours. Tip: Before getting started check you insulation levels and determine if you need to add more insulation before you add the foil. Start in a far corner and start rolling out the foil over the insulation; this works best when you use the pre-cut pieces. Another option is to pull the foil into the corner. If the area is hard to reach use a pole, PVC pipe or a 1×2 board with a nail taped on the end. You can easily stab the foil and move it far back into hard to reach areas. If you have large, open areas in your attic consider this trick: cut the foil on your driveway (or yard) and then tape 2 or 3 pieces side by side to make either an 8′ or 12′ wide piece. This will form one large piece of foil that will cover more area, more quickly. For example, if you make a piece 20 feet long and 12 feet wide, you can cover an area of about 240 square feet very quickly. Just roll the foil up like a big rug, take it into the attic and roll it out. It’s that simple. Overlap the foil sheets about 1-2 inches and use small pieces of foil tape to attach the pieces together. It is not necessary to attach the pieces, but many people will do this to hold the foil together. If you need to get to something below the foil, just undo the tape and slide the foil to the side. Do not push the foil down into the attic insulation. The foil works best and is most effective if there is about a 1″-2″ gap between the foil and the top of the insulation. So, just lay it out nice and easy. Your insulation has little peaks and valleys in it, usually these little peaks work perfectly to keep most of the foil a little bit above the insulation. If you have batt insulation, try purchasing an extra batt and tearing it into golf ball sized chunks and sprinkle them over the batts to create peaks and valleys. 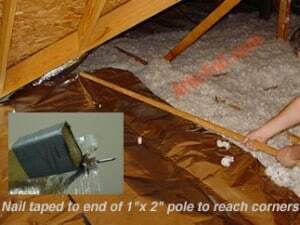 When you installation is done, the foil should only have about 5-10% actual contact with the top of the attic insulation. Tip: Worried about dust accumulation on the top side of the foil layer? Check out this page on Dust Accumulation and Double-Sided Radiant Barrier. Supports, braces and other obstacles. Cut around these items, it does not have to be perfect or pretty; small gaps in the foil are OK. Just cut a slit, wrap the foil around the obstacle and use a small piece of foil tape to tack it back together. Try using a “Double-T” cut (see photo) to make the foil lay flat around obstacles. Vaulted/Cathedral or Tapered Ceilings. You might have an area with a ceiling that tapers down and is very hard to reach. Just tape a couple of pieces of foil together and let it roll down into the hard area to reach. Then, use a pole with a nail to push it around until it covers the area intended. Attic flooring/decking. Yes, you can install the foil directly over your existing attic floor decking*, it can handle light to moderate traffic. Just be sure to pull the foil nice and tight to avoid anyone tripping and mark the outline (with tape or spray paint) of the decking if it doesn’t cover the whole attic, that way you will know where it ends so you don’t accidentally step off the edge and through your ceiling. *While you can add AtticFoil™ on top of your existing plywood floor, you can not then cover the foil with anything else, this includes another sheet of plywood, insulation, storage, etc. Why? Because then there is no air gap above the foil. When you eliminate the air gap, you render the foil useless because without an air gap radiant heat cannot exist. Unless you can get an air space on at least one side of the foil then it won’t work; you can’t sandwich the foil between two objects and still call it a radiant barrier. For truss-type attics, the best product to use is the 26″ wide AtticFoil. Measure the distance from the center of the attic under the ridge to the edge of the outside walls and then pre-cut the pieces to fit this length. Then, start at the furthest point (from the attic entry) and work towards the exit. Inside each truss, push one piece from the center to each side. Then proceed to the next truss opening. Remember, you do not need to tape the foil together; the pieces of foil will usually overlap one another by a couple of inches. Tip: Use a pole with a nail taped on either end to push the foil out the the edges that are beyond your reach. Check for air leaks in the ceiling. Although we offer the perforated radiant barrier foil, there is a potential for moisture to condensate if too much warm moist air is leaking out through the ceiling. In areas of cold weather, this can not be emphasized enough. Can lights, fixtures and attic doors are the main culprits of air leakage. These leaks should be sealed up before installing foil. Also, if you have any duct leakage, this can put the home under positive pressure. Since positive pressure pushes air out of the home, even a small hole can allow a lot of warm-moist air to get pushed into the attic. SuperPerf™ AtticFoil™ is punch-perforated and extra permeable so a good amount of moisture can get past it, but even so, too much moisture can overwhelm the foil’s holes and it will not be able to keep up/allow the insulation to dry out. Radiant barrier foil does not cause moisture. If you are installing the foil over a standard sheetrock ceiling with no holes/penetrations, then the foil will handle any residual moisture vapor passing through. Do not compress your insulation. This will reduce the drying potential for the insulation and reduce its overall effectiveness. 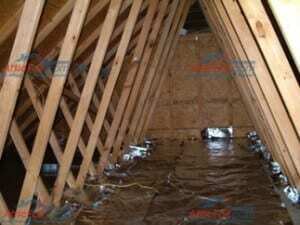 Lay the radiant barrier foil loosely over the attic insulation. Do not press into the insulation. Your insulation will have some peaks and valleys and this is desirable. Ideally you want about 10-20% surface contact with the foil. Tip: Foil radiant barrier does not cause moisture. For more info on managing moisture in your attic read our page on Moisture & Radiant Barrier Foil. Remember, don’t cover up/block your soffit intake vents when laying the foil down to the edges of the attic. Good attic ventilation is important because keeping air moving through an attic not only keeps the air temperature cooler in the attic, but it also helps to remove moisture. Once you’ve finished the large open areas, then you can go back and attempt to cover any smaller or hard-to-reach places in the attic that you skipped over. 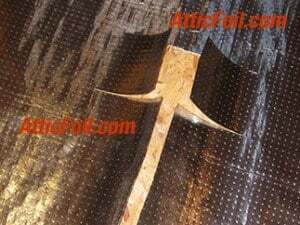 Keep in mind that you don’t have to cover every square inch of the attic for the foil to work, AtticFoil™ has a cumulative effect, so partial coverage still works! If you’d like to see some examples of successful attic installations where the foil was laid on top of the insulation, check out our customer DIY Project Gallery.